Designing a new AP from the ground up prompts many questions. How should the AP look? What features should it include? How will it stand out in a crowded market? First on the list has to be the experience clients will enjoy whilst using the AP in the real world, so every AP must provide excellent coverage, ensuring solid connections and performance. Central to the role of every AP are its antennas. At the most basic level, an antenna simply takes the output from the AP radio, then converts and emits it as radio waves which carry the modulated data signal. Received radio waves, from clients or mesh APs, are converted in the other direction. Typically multiple antennas are employed for WiFi, providing a degree of spatial diversity and improving signal reliability. The style of antenna will determine the radiation pattern and range achievable. Omnidirectional antennas (always used inside our indoor APs, and an option for the outdoor models) propagate radio waves in all directions on one plane as equally as possible, making them suitable for general use. Sector and patch antennas are designed to focus the wireless signal in a specific direction, without wasting energy on covering space with no clients. This makes them particularly suited to outdoor use, for example against the external wall of a building (usually a sector antenna), or for building point–to–point links (usually a patch design). With the all–new MR32 and MR72 models, our team had an opportunity to revisit both internal and external antennas. Both models feature dual radios with dual antennas for both the 2.4GHz and 5GHz bands, but that’s just the start. In common with the rest of the Meraki AP lineup, the new APs incorporate a separate, dedicated radio and antenna which we refer to as the Security Radio. By keeping this radio separate it is possible to provide real–time scanning of all channels across both bands, helping to identify any potential nefarious behavior (WIDS/WIPS functionality) and providing accurate radio interference information. We’re not done yet. Inside the new models is yet another radio and dedicated antenna, this time adding Beacon support using Bluetooth Low Energy technology. The design team decided to go with a dedicated, separate antenna rather than one built onto the circuit board in order to provide superior coverage. The results speak for themselves, with the BLE antenna providing comparable coverage to the one used for 2.4GHz WiFi on the MR32. Further details on the MR32, including WiFi antenna radiation patterns, can be found in our datasheet. New WiFi antennas have also been added for our first outdoor 802.11ac access point, the MR72. Outdoor environments generally require more customized signal patterns, and so the range includes modular omnidirectional, sector and patch antennas, each capable of operating over an expanded temperature range from -40F to 158F (-40C to 70C). This newly improved temperature support on the MR72 will ensure Meraki APs can be deployed in even more extreme outdoor environments. Dedicated security and BLE radios and antennas, shared with the MR32 design, remain inside the AP body. 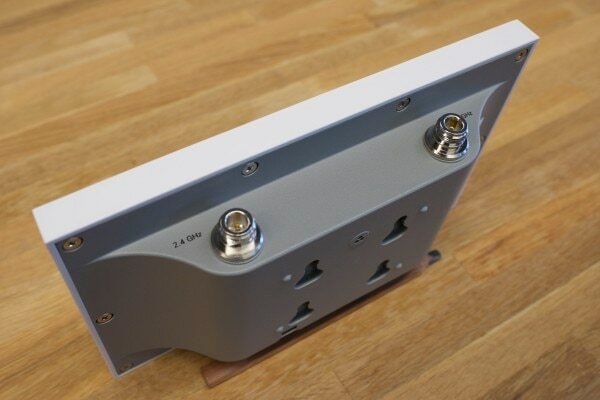 As with previous outdoor models, our customers are not limited to Meraki external antennas. The MR72 uses industry standard N-type connectors, allowing any compatible antenna to be connected for specific coverage types. Whatever antenna is connected, the AP itself is supported as part of the AP license. The MR72 also has its own datasheet for more details. With each new model, the Meraki team is further extending the usefulness of the access point to the customer. The opportunity now exists to provide valuable insight into customer proximity and enabling applications for driving customer engagement. A best–in–class AP is no longer simply about providing connectivity for wireless clients, but this will always remain a Meraki AP’s primary function, so the multiple antennas we employ can be thought of as the essential foundation for everything required of a modern wireless network.